Jason Ringenberg "John the Baptist Was a Real Humdinger"
Becky Warren "We're All We Got"
It was with sorrow that we watched Notre Dame in flames earlier this week. For anyone that has visited, you know the serenity and awe that walking in brought. Notre Dame is as much a testament to faith as it is to the greatness in man for its scope and beauty. We persevere, we rebuild, we carry on. This is Holy Week, and its an unusual one, as both Passover and Easter are aligned this year. No matter what you celebrate, or even if you don’t, spring is the season of renewal and rebirth. And leave it to Jason Ringenberg to bring a fresh slant to the story of John The Baptist. So you know, Jason is the eponymous "Jason" of Jason & The Scorchers, yes, the original punk roots barnstormers. J&TS brought an early take to the world of Cow Punk Rock and Roll, paving the way for what would become Americana itself. Jason hadn’t recorded a new album for quite a while, nor was he planning to, until he got an offer from the Parks Service to write in a cabin in Sequoia National Park. The tunes came bubbling up. 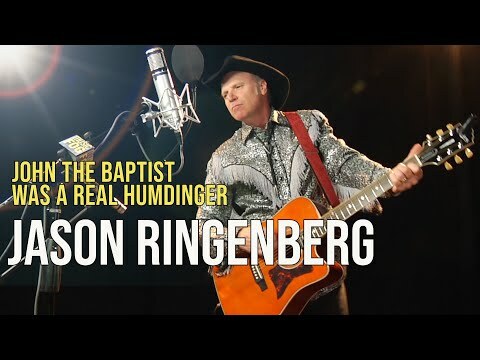 The new album is called Stand Tall, and this is one of the songs you will find on it, “John The Baptist Was a Real Humdinger.” And yeah, so is Jason Ringenberg! Here is the Music Fog recording from this past February in Nashville, part of our 10th Anniversary Sessions. What were you doing in 1969? My radio station, WMOT, was signing on for the very first time. It happened on April 9th at 5pm, and we are celebrating the moment with an event at that very time. Liz Brasher, AJ Croce and Adam Wakefield will be joining us to bring the tunes and WMOT will be broadcasting live, plus providing a live video feed on NPR Music/VuHaus. 1969 was just a bit before I got into radio, but FM was already a focus for me. The music was hypnotic. It was also a cultural beacon, bringing us together to protest, and soothing our souls. It was an important voice in our lives. Of course, we Foggers still think it is. Today’s video is from the courageous Becky Warren, who writes from a very 60’s perspective, putting danger aside to get the story. Her last album was centered in the stories of returning soldiers. The new album, Undesirable, was written from the perspective of the folks selling newspapers on the corners of Nashville streets. Becky hung out with them to gain their trust and hear their stories. It begat songs that are deep and rich. Check this out and see if it doesn’t resonate. We know these folks...we see them every day. Becky Warren’s “We’re All We Got,” as captured by Music Fog this past February in Nashville.